Today’s guest picture comes from my brother Andrew, who was half way up Snowdon in Wales when he saw this view yesterday. He says that the best thing about climbing Snowdon is that you can get a cup of tea at the top but the view is pretty good too. Our spell of dry and windy weather continued today with both more sun and more wind than yesterday. It seems a long time now since we had any serious rain. The garden is enjoying the weather and doesn’t seem to be needing rain yet though. It is hard to beat a sight like this when I went out into the garden after breakfast. It is apple blossom time. Mrs Tootlepedal’s front beds don’t get the sunshine until a bit later but the mixed tulips were quite bright enough without any help. I had intended to go for an early bike ride but I wasn’t feeling very perky, probably because my asthma was playing up a bit and definitely because the wind seemed to be very strong so I idled quite a bit of the morning away before I finally chased myself out of the house. I was glad to be out. It was a sparkling day and the wind blew me up the hill and made the start of my ride very easy. Because of the stiff breeze, gusting at well over 25 mile an hour at times, I decided to use my valley bottom ‘outdoor gym’ and cycle 25 miles by repeating the four mile trip up to Cleughfoot and back three times. The wind was so strong that I took more or less exactly the same amount of time to cycle up the hill as I did to cycle back down again and on the third iteration of the route, I set my fastest ever time for the three uphill miles from Pool Corner to Wauchope School. I also stopped for photos, as my modest speed let me keep an eye for points of interest like these bright things on a conifer. I couldn’t miss the gorse which is as good as I have ever seen it this year. There were lambs bleating in every field. 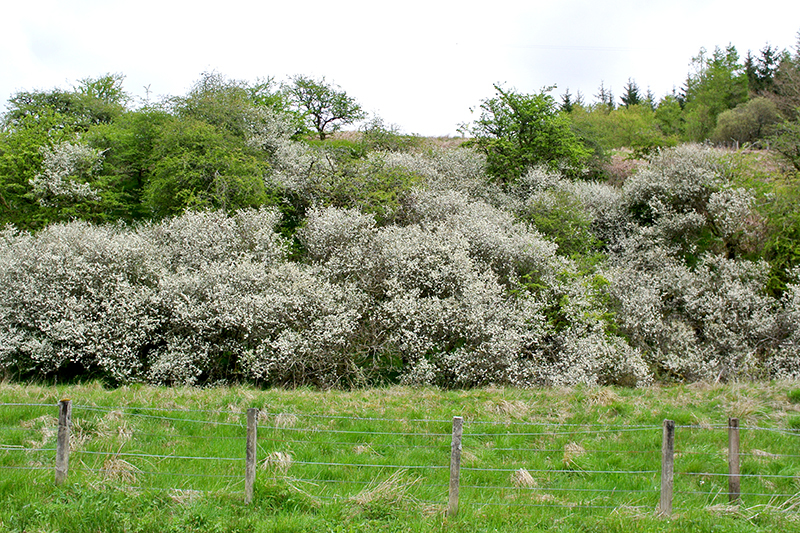 And the blackthorn blossom at one point was sensational. …but this did let me appreciate just how bent the rocks beside it are. Our peaceful countryside has been the subject of some powerful forces not so long ago. I had another look at the apple blossom when I got back to see if there were any bees about. 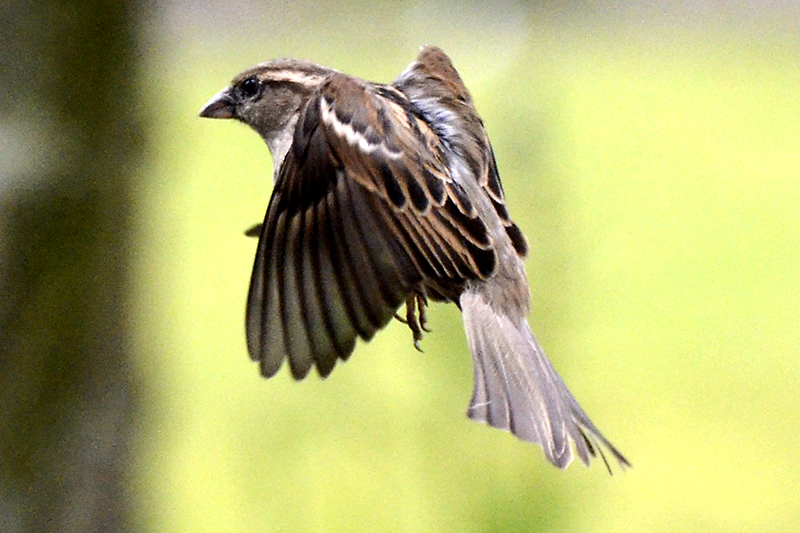 The bird seed was going down at the usual speed. Mrs Tootlepedal had been helping out with the lunches at the Buccleuch Centre so we had a late lunch when she got back and while she had a well deserved rest, I pottered around the garden, dead heading yet more daffodils and some of the early tulips. 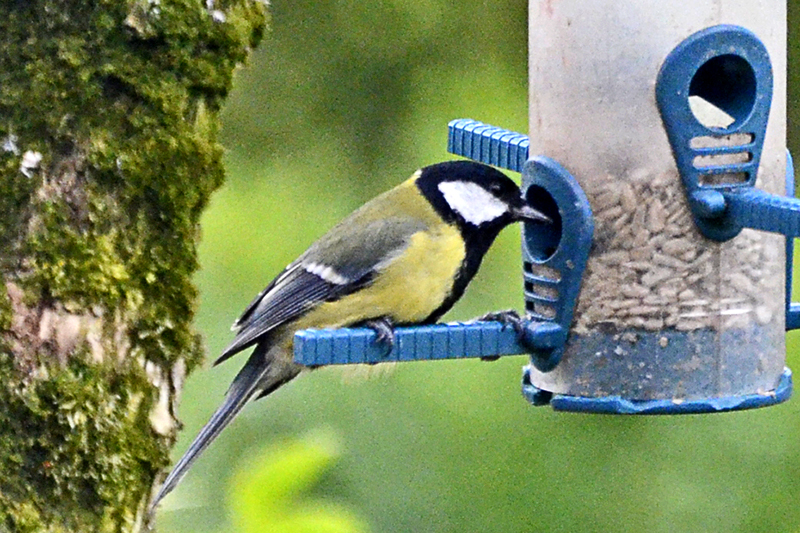 I roused Mrs Tootlepedal and we drove down to the animal feed shop south of Longtown where I get my bird seed. I bought a big bag of seed which I got free, courtesy of a generous bribe from BT in the form of a prepaid card which they gave me when I changed my internet supplier to them recently. I may well repay them by changing to another supplier when my cheap first year runs out. We stopped in Longtown on our way home and I took a quick walk along the river. The bridge of many arches was looking good in the sunshine. In fact it was looking so good that I thought I might try taking three pictures and merging them using Photoshop, a technique I learned at the last Camera Club meeting. You can click on the picture for a larger view. The technique works pretty well. I couldn’t see the joins. …and in the shelter of the trees, it was a beautifully warm day. I was delighted to see an orange tip butterfly and even more delighted when it thoughtfully posed for me. A small tortoiseshell was not so obliging. There were wild flowers on view as well. Between the cycle ride, pottering about the garden and the riverside walk, I took far too many pictures today but the weather is due to be fine again for the next two days so I will have plenty of opportunity to take many more. In the evening, Mrs Tootlepedal went off to an Archaeological Society meeting and I went to sing with the Langholm Community choir. When I came out, there was a very beautiful sunset to round off an enjoyable day. Luckily I didn’t have my camera with me as I think that the 80,000,000 pictures of lovely sunsets already on the internet are probably more than enough….but it was a particularly good one. 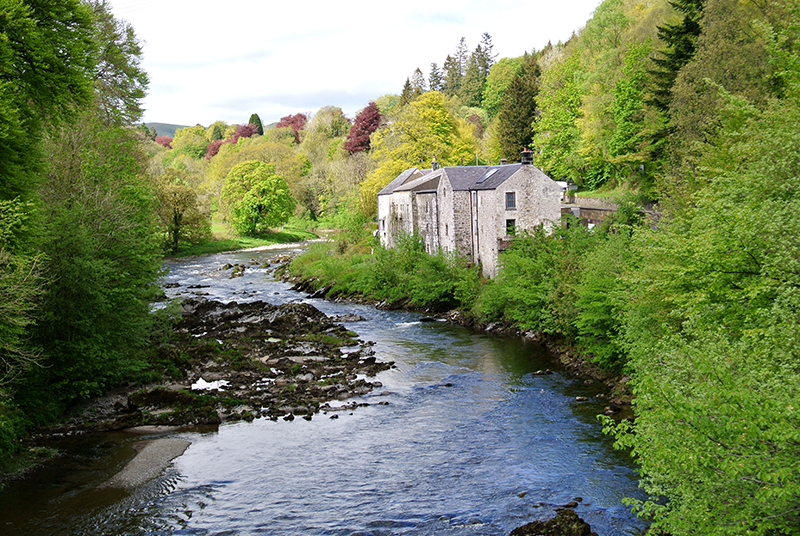 The title of the blog today refers both to the wind, which was hard to beat when I pedalled against it in the morning, the beautiful river views at Longtown in the afternoon which were looking as good as I have ever seen them and finally the speed at which our conductor in the evening took one of our pieces. A beat that I found it was very hard to keep up with. I didn’t have much time for flying birds today and this goldfinch, threading its way towards the feeder, was the best that I could do. Today’s guest picture comes from our daughter Annie. She has been working hard in her allotment and has got a nice selection of seeds doing what seeds do. The forecast said “Rain later” but the morning was a continuation of our sunny spell with the added benefit of enough haze about to keep the temperature up. Under the circumstances, the obvious thing to do was to get out the fairly speedy bike and go for a ride so I did exactly that. The question of what to wear was important. The temperature when I started was about 6° or 7°C which is by no means warm but it was bound to be warmer as the day went on so the trick was to find a combination which wouldn’t let me freeze at the start or boil at the finish. The wise reader will say that one can start with an extra layer and take it off as the day warms up and this is true but harder to do for your feet and legs and head and if you have to take gloves, overshoes, skull caps and jerseys off then you have to stow them somewhere and that means carrying bags….and so on. Still, I made a one off choice and was a bit chilly at the start and a little hot at the finish but quite contentedly so in both cases. I did swap gloves for mitts at Eccelefechan. I should add that this is only a problem for the older cyclist. The young ones just put on shorts and a vest and go out regardless. The wind was light, the roads were empty and the route choice was good so I enjoyed my ride. It really felt like spring and I was serenaded by lambs in many places on the ride. I love this bridge at Paddockhole because the riparian owners have clearly heeded my plea to make bridges accessible to passing photographers. The banks used to be covered with scrub. All bridges should be like this. The bridge crosses the Water of Milk and I always enjoy looking at the Water further along as it snakes through the hills. You can see from the picture above that it was very hazy so I took no views today. I cycled along the Lockerbie road but turned off a few miles before the town to follow the Water of Milk down its valley. The road crosses the main railway line and the motorway and between the two I stopped between where a new road has been constructed to cross the motorway. 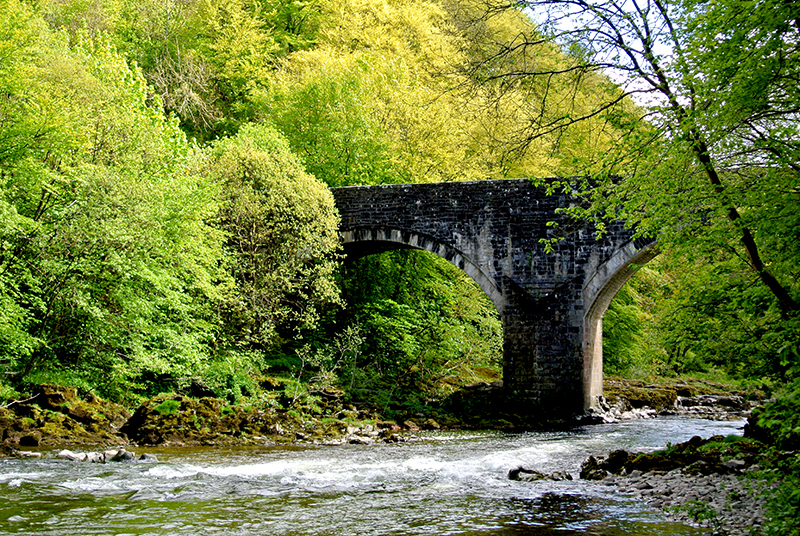 I walked a short way down the old road to find a little bridge crossing a tributary of the Water of Milk. There were laid back lambs in the field here…. 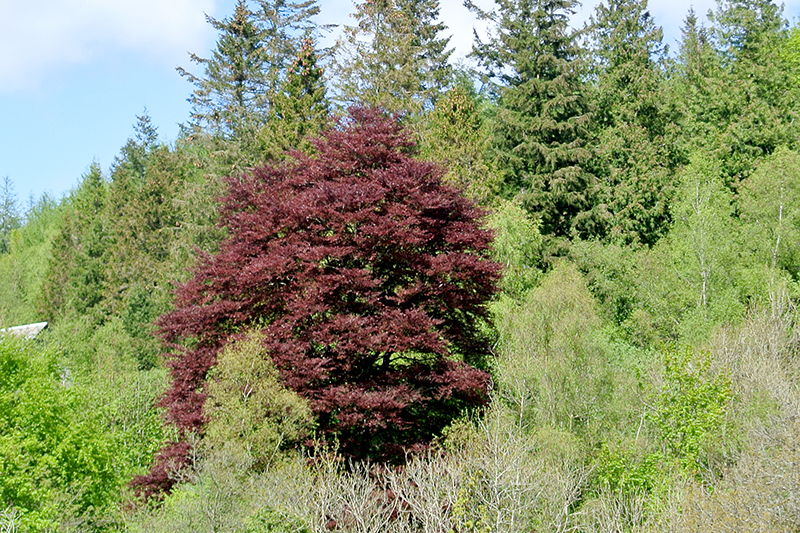 …and a magnificent roadside tree. This was the most scenic part of my route (and the hilliest) and for the next section I pedalled along the rather dull old A74 to Gretna. I stopped for a snack at Ecclefechan and parked my bike against a concrete post well supplied with lichen…. …and the sensible energy choices of a householder and a small business in the village. I kept an eye out for spring in the hedges as I pedalled down the long straight road to Gretna and it wasn’t hard to find some evidence. I was following well travelled roads after Gretna so I kept my camera in my pocket and concentrated on getting home. I was once again seized by decimal fever when I got into the town and had to cycle right through it and go a mile out of the other side so that I could ring up an exact 50 miles for the outing. This took me to just over 500 miles for the month and left me ahead of schedule for the year so I cannot complain about March from a cycling point of view at all. I had enough energy for a stroll round the garden when i got home (Mrs Tootlepedal was busy there already of course). There is a steady supply of frogs peeping through the weeds in the pond at the moment. There was nothing new in the floral department to catch the eye but the weather for the next few days is going to be warm and wet so I am expecting quite a bit of growth. 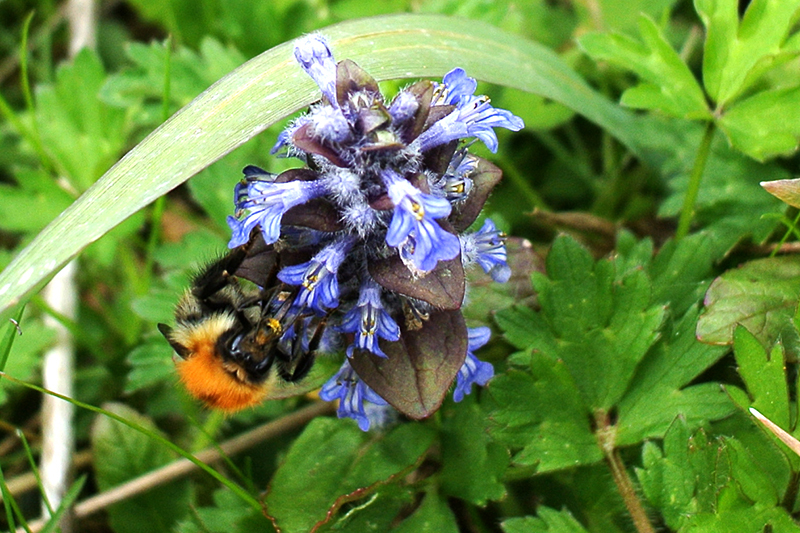 I did see a most unusual large bumble bee with a very red back but this was the best picture that I could get of it. I think that it is probably a tree bumble bee, a relatively new arrival in Scotland which would explain why I have never seen one before. I did think of sieving some compost and mowing a lawn but strangely found sitting down and having a cup of tea and a biscuit with Mrs Tootlepedal more attractive. I looked out of the window though. The large flock of siskins which has been eating me out of house and home has moved on, leaving one or two to come to the feeder but there were plenty of chaffinches and goldfinches to fill the gap. Spot the single siskin at the top of the picture. Some bad bird has made off with two of the perch bars for one of the feeders but goldfinches are quite good at clinging on to the feeder regardless. I had to pay a routine visit to the Health Centre to top up my system and when I got back, another look out of the window was rewarded with a sighting of a redpoll in very bright raiment. Attracting female attention is the name of the game. Not long afterwards, the promised rain arrived so I was very pleased to have made good use of the recent fine weather by cycling every day for the last six days. The flying bird of the day is a chaffinch trying to work out where the missing perches are. Those interested may get further details of the ride by clicking on the map below. The calorie counter is a fantasy. I ended the ride heavier than I started! 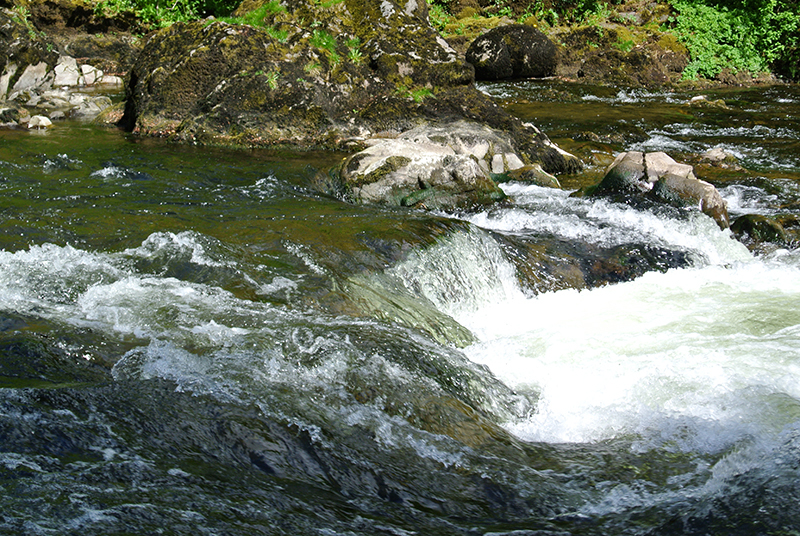 Today’s guest picture is another from my siblings recent visit to the Lake District. Mary managed to capture this lovely shot of Ullswater out of the car window. One of my little plans is to have at least one cycle ride every year in which the number of miles equals or exceeds my age (and to keep doing this for as long as possible). The mathematically minded among you will realise that this will become a greater challenge as the years go by but as I am a mere 74 at the moment, it is not a great problem. Today seemed like a good day to get it out of the way for this year as the forecast promised dry conditions with occasional sunshine and a light wind in my face on the way to my outward destination. In addition, the wind was to get up a bit about the time that I would turn for home and blow me back so everything looked ideal. Often reality does not meet with expectation but today it did. I set out with the intention of reaching the cafe at the Wildfowl and Wetlands Trust at Caerlaverock in nice time for lunch and I arrived just after one o’clock. Even a lightish wind makes for hard going on the exposed road along the Solway shore so I was quite ready for soup and a hot pie when I got there. 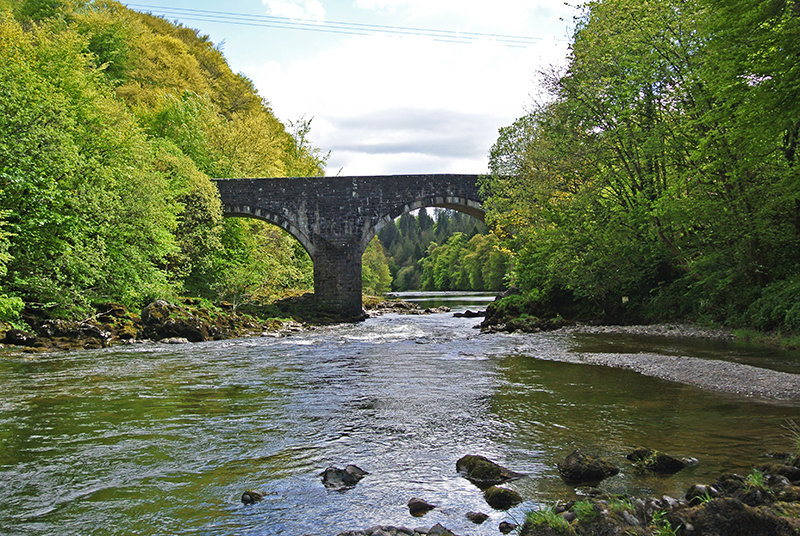 …and the bridge at Bankend. There was a very pretty view upstream from the bridge and the sharp eyed will notice a ruined peel tower in the distance. My last stop, just before lunch, was to admire some very hefty birch polypores beside the road. I didn’t linger long after my lunch and was soon on my way home. The road from the WWT was lined with wild flowers. I made good progress with a more friendly wind and was a bit reluctant to stop for photo ops but the scene at the Brow Well was too good to miss. Today, it looked a bit different. I think that it is fair to say that there was a very high tide. It was nearly up to the road. I have passed this spot many times both on a bike and in a car and have never seen the tide this high before. It was still quite high when I crossed the River Annan as I came into the town some time later. My last stop was for a banana on the international bridge over the Sark at Gretna. I looked over the seaward parapet and was delighted to see an unexpected blackthorn in full blossom beside the river. From then on, it was full steam ahead for home and I just managed to squeeze the average speed up to 14 mph for the 78 mile ride, thanks to the kindly wind. My distance calculations were a bit out but the extra four miles didn’t hurt too much at all. As an additional bonus, the ride took me over 1000 miles for the year. I should have hot this target on 31 March but being only eight days late is not too bad considering the terrible weather in January. Mrs Tootlepedal was busy in the garden when I arrived home so I joined her for a stroll round the policies. Tulip anticipation is at fever pitch. More flowers are growing every day. And old friends are looking better all the time. But mostly, Mrs Tootlepedal is saying it with daffodils. And sometimes so discreetly hidden between box ball and hedge that only the privileged few can glimpse them. I did have time for a sit and look out of the window where I saw a wood pigeon auditioning for the role of Mr Grumpy should it become vacant. Some loud quacking drew me back out of the house and I saw our resident pair of ducks beside the dam. Feeling unaccountably tired, I went for a bath while Mrs Tootlepedal kindly cooked my tea and I was recovered enough to play some enjoyable music with Alison Tinker when she and Mike came round for their customary Friday visit. Mrs Tootlepedal was feeling very cheerful today as not only had she framed some very nice Matilda pictures and hung them on the wall but she had also been granted access to a very fine manure mine. It is on hard standing and she can back the car right up to the heap which avoids any double handling. She can hardly wait to visit it. In all the excitement of the day, I didn’t have much time to look for a flying bird so I was grateful to a chaffinch for turning back and doing its best to get into the shot. 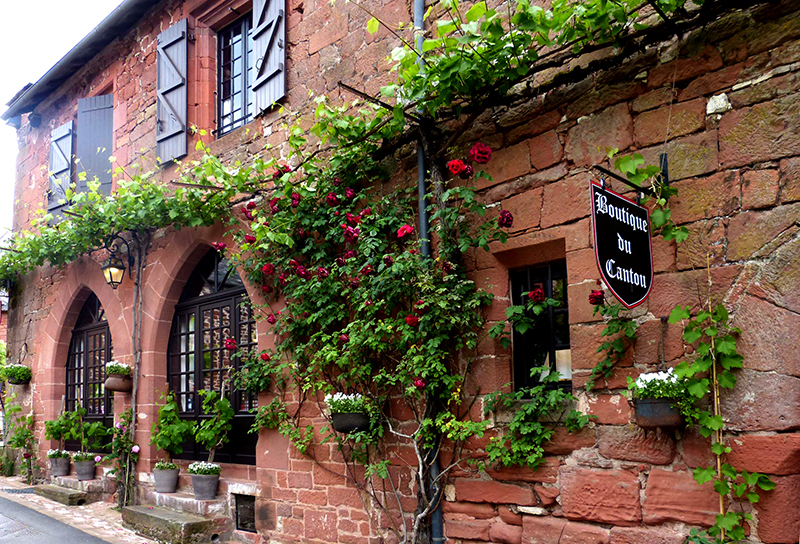 Today’s guest picture comes from Venetia, my Somerset correspondent, who has been away in France. The picture shows a charming boutique in Collanges-la-Rouge. A cloudy and windy morning gave rise to quite a long internal debate over the pleasures of cycling. In the end though,my sense of derring-do just won out over my tendency to derring-don’t and I set off up the Wauchope road on the fairly speedy bike. I was glad that I had gone as my legs and I were in harmony from the start and I even stopped to take a photo or two. Due to a combination of the cold spring and some wanton mowing of the verges by the council, there are not many wild flowers to see on the way but I was impressed by this display of blackthorn blossom near Westwater. 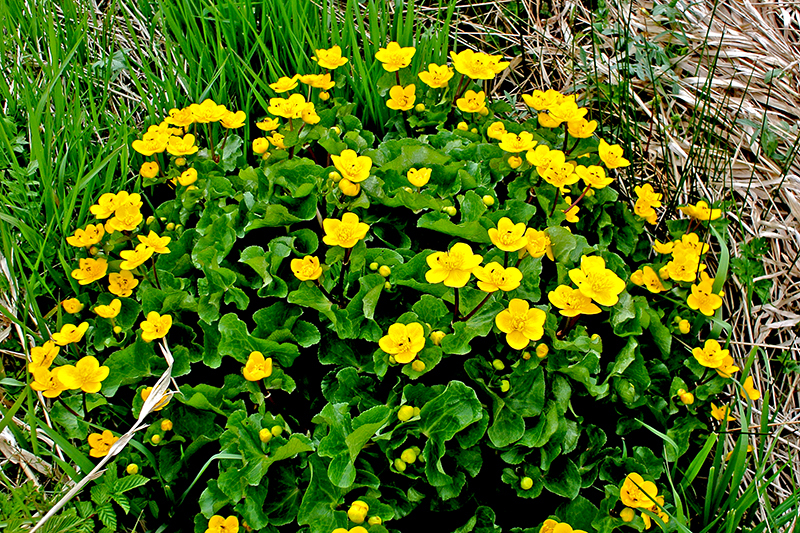 On the other side of the road, a splash of yellow in a ditch caught my attention. Almost every flower had a little insect attached. Nearby an orange bee was busy. I didn’t stop again until I was nearly at Paddockhole, my outward destination. One of my favourite views caused me to take the camera out to record ‘fifty shades of green’. An indication of the power of the wind may be gathered from the fact that I glanced down at my bike computer on my way home to find that I was doing 30 mph along a pretty flat piece of road. I was more impressed by my outward speed than I had been at the time that I was puffing along against the wind. I really am getting fit enough so that a little wind shouldn’t be an excuse any more to stop me going out. It probably will be but it shouldn’t be. When I got home, Granny and Mrs Tootlepedal were in the garden so I joined them and took a couple of pictures. 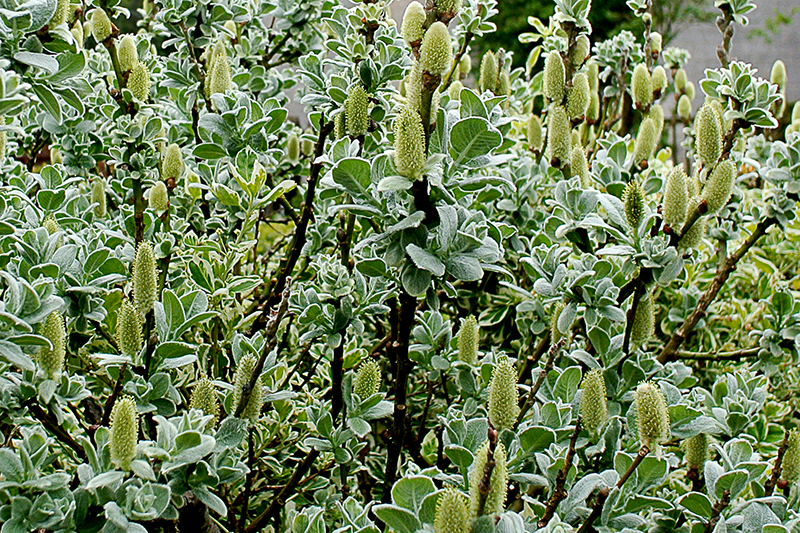 One of Mrs Tootlepedal’s two willows going great guns. There are several colourful corners developing in the garden but I concentrated on some details today. The day steadily improved and by the afternoon, it was a pleasant spring day (but still breezy). After lunch, I took the two paintings which had been given to me to look after by Mrs Turner up to to one of our local picture framers. He agreed to frame them so that they can be hung up in our new visitor centre when it is ready. His studio was one of many locally that were open today as part of the Spring Fling and I visited four others while I was in the centre of town. My favourite was the studio of Julie Dumbarton but as photography was not allowed, you will have to visit her website if you want to see what it is that I like about her work. I would need a bigger house (and a much bigger wallet) if I was going to buy one of her paintings though. Because I was thinking about the two water colours that are being framed, I walked on down to Skippers Bridge to see if I could show the ancient and modern together. It was not entirely possible but I did my best. 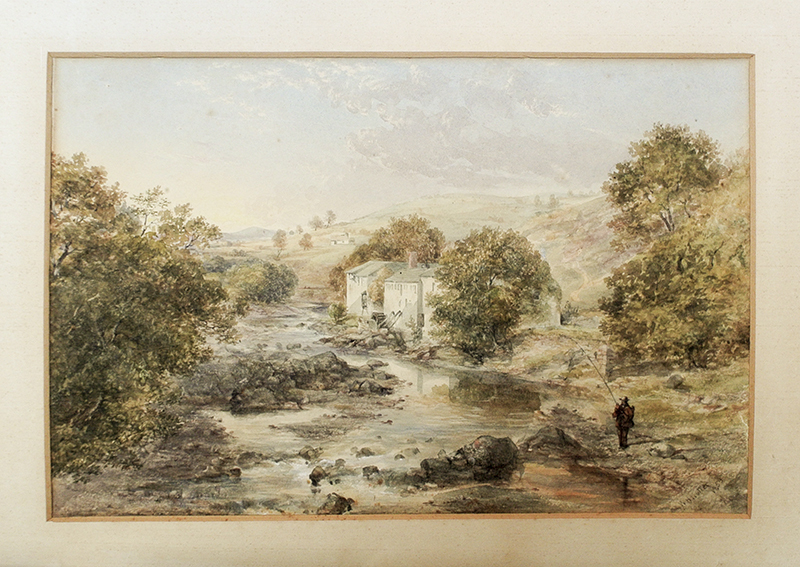 The view upstream in 1859 as seen by William Nutter…..
…and in 2015 as seen by me. What is most noticeable when you look at old paintings and photographs of the town is how many more trees there are today. I couldn’t get down to the river on the same bank as William used for his picture of the bridge but I scrambled down the other bank and got as far out into the river as I could. There were still too many trees. Mr Nutter in 1859 saw this…. …and I saw this in 2015. 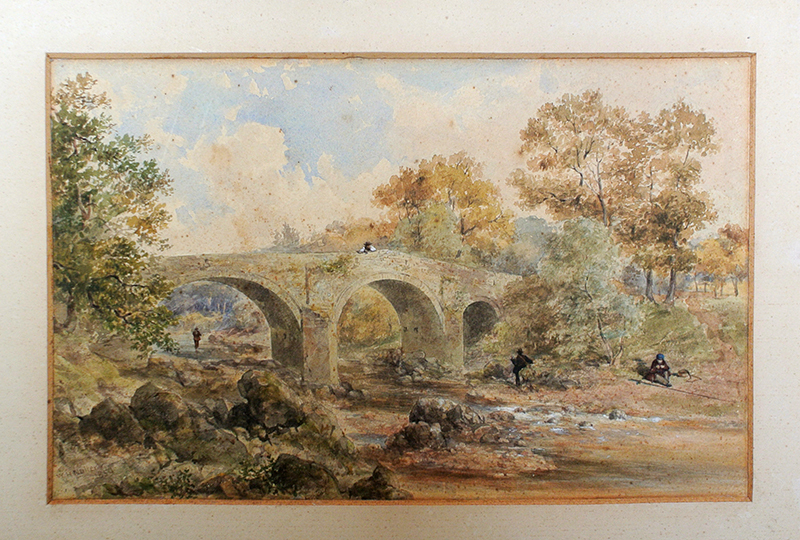 The bridge has been widened by about a half since the painting was made. The scramble down the bank was quite exciting and so I thought that I would take some pictures of my own while I was down by the water’s edge. 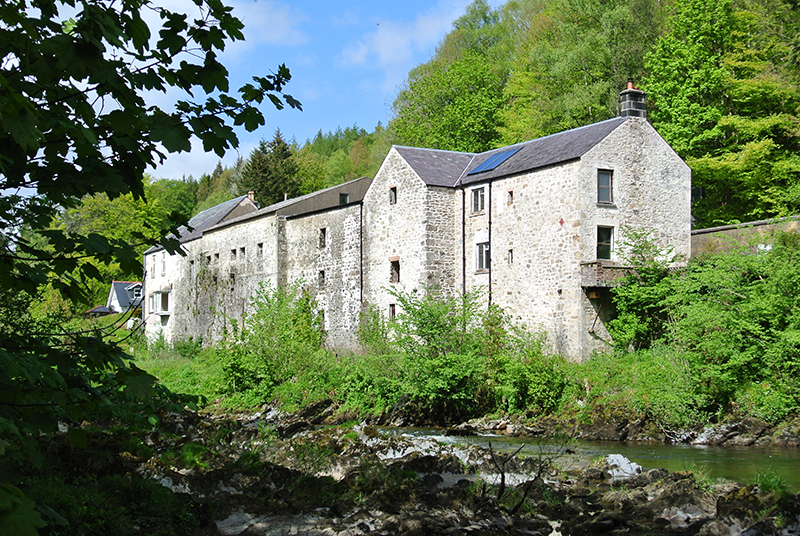 This is my view of the distillery. And this is my view of the bridge disappearing into the spring foliage. After a last glance at the river…. …I scrambled arduously back up the bank….and noticed a much easier path a few yards further along. 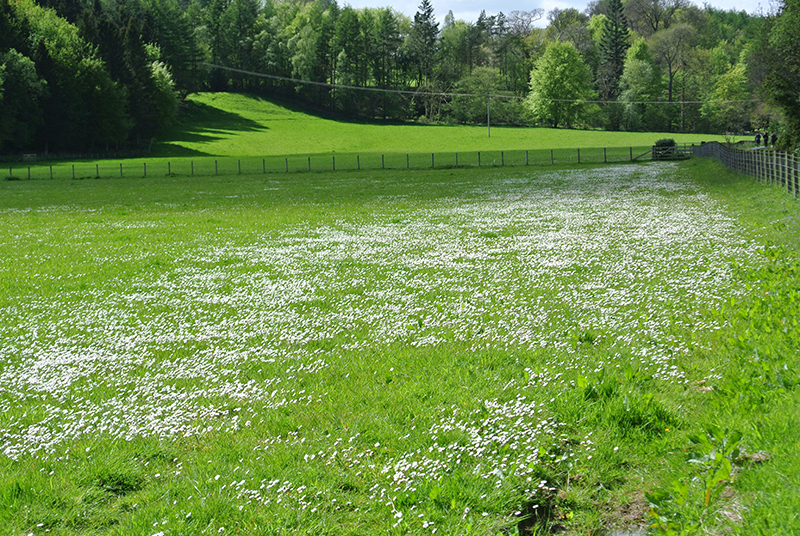 My walk back home on the west bank of the river was made very attractive by a river of daises on the Murtholm…. ….a fine copper beech on the opposite bank…. 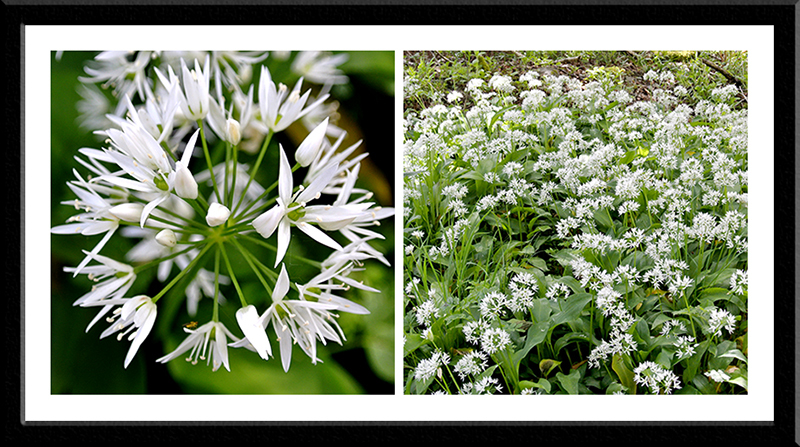 ….a burst of wild garlic at the end of the fields…. 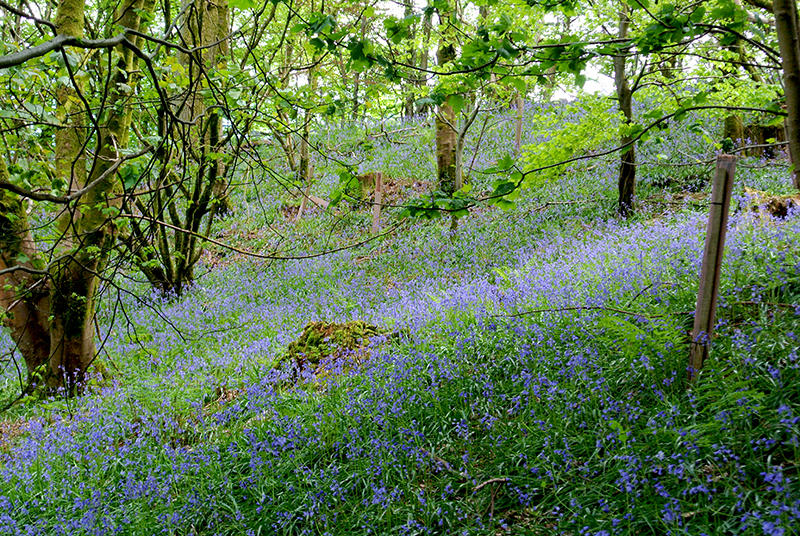 …a swathe of bluebells in the woods…. 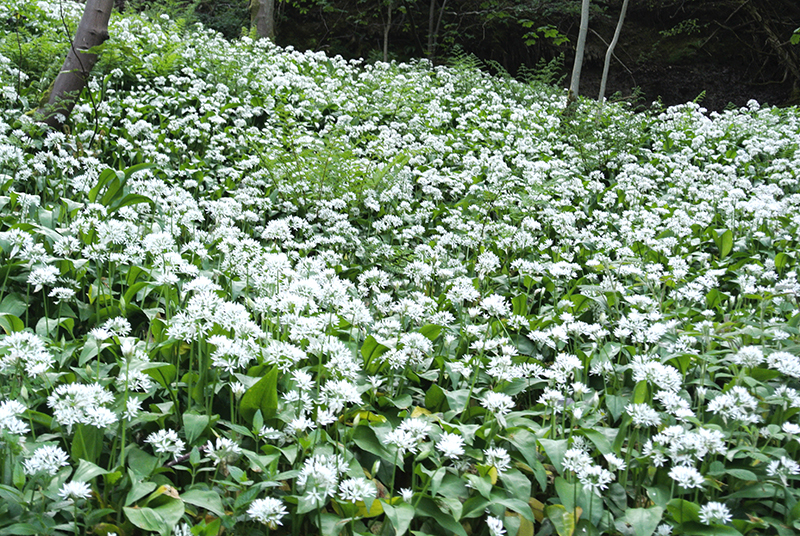 …and a final flood of garlic down the banking just before the park. The walk was full of sensation for the eye and the nose too. It was rounded off by a cup of tea and a slice of banana and walnut loaf when I got home. 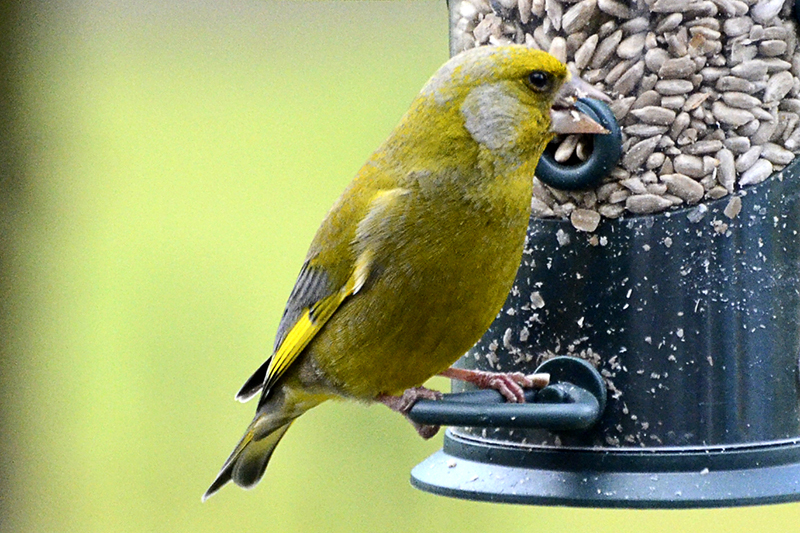 …and greenfinches make me smile with their apparent solemnity. This reminds me that I found the new feeder on the ground when I came down this morning so the rooks have obviously been busy again. I must tie it up safely before I go to bed tonight. My flute pupil Luke came and we had a useful practice. As we are playing in public on Saturday, I have arranged an extra go for Friday evening. You can’t have too many practices before a performance, however brief. Mrs Tootlepedal took Granny for a short but scenic drive after tea while I practised a little singing and cut the seventy pictures on my camera card down to a nearly manageable number.